This entry was posted in storytelling and tagged bereavement, Bog Meadows, friendship, loss by Margaret French. Bookmark the permalink. So many lovely memories, so many strong emotions but what came to my mind at the end of your loving post was that Mary’s life was well-lived. You have given her such a beautiful tribute. Would we all have such friends such as you in our lives. Thank you for sharing Mary with me, if only for a moment or two. Thanks, Karen. I’ve lucky to have some wonderful friends. What a truly eloquent tribute. Mary sounds like someone I would have enjoyed knowing, like someone who has left the world a poorer place. How beautiful said. I am so sorry for your loss but glad that you were lucky to have someone so special in your life. Thanks for sharing. Such beautiful wonderful memories so wonderfully remembered. And your teacups; though Mary never drank from them, will remind you of her and your special friendship. I’m sorry you won’t become old ladies together. Thank you for sharing your love for her with us. A lovely and heart-wrenching tribute to your Mary. She sounds like a wonderful friend and someone you surely miss dearly. What a beautiful friendship you two had. Sweet memories. Thank you for sharing. What a beautiful tribute. My great-aunt pressed teacups on me from her collection. 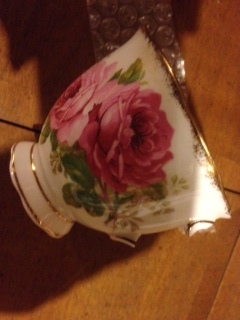 Chipped and broken, I treasure them in her memory and bring them out for tea parties when my granddaughter visits. Thanks for sharing.